Disocactus flagelliformis, commonly known as Rat Tail Cactus, is a cactus with a thick hanging stems, each with 8 to 13 ribs up to 3.3 feet (1 m) long and up to 0.75 inches (1.9 cm) in diameter. The needle groups are tiny, almost fuzzy-looking and have 15 to 20, fine, reddish-yellow spines each. Flowers are a beautiful, magenta color, curved, up to 3 inches (7.5 cm) long and up to 1.5 inches (3.8 cm) in diameter. Rat Tail Cactus is epiphytic in the wild (it grows in trees). It is perfectly adapted to hanging baskets. It is the most cultivated species in the genus. Due to its ease of cultivation and attractive floral displays, Rat Tail Cactus is often grown as an ornamental pot plant. Light: It requires full sunlight. Hang the pot or basket in the sunniest window available. If possible, hang the plant outdoors in summer to give it fresh air and extra light. Soil: A good draining soil mix that is gritty is advisable to use, which is sold and used for cacti and succulents. Temperature: During the active growth period normal room temperatures are suitable. In winter these plants should be rested at 45 to 50 °F (7 to 10 °C) if possible, but they tolerate temperatures up to 59 to 61 °F (15 to 16 °C). Watering: During the active growth period water plentifully, keeping the potting mixture thoroughly moist, but do not let plants stand in water. During the winter rest period just keep the mixture from drying out. Fertilizing: Use half-strength liquid fertilizer sprayed on to the stems of the plant once every 2 weeks during the active growth period only. 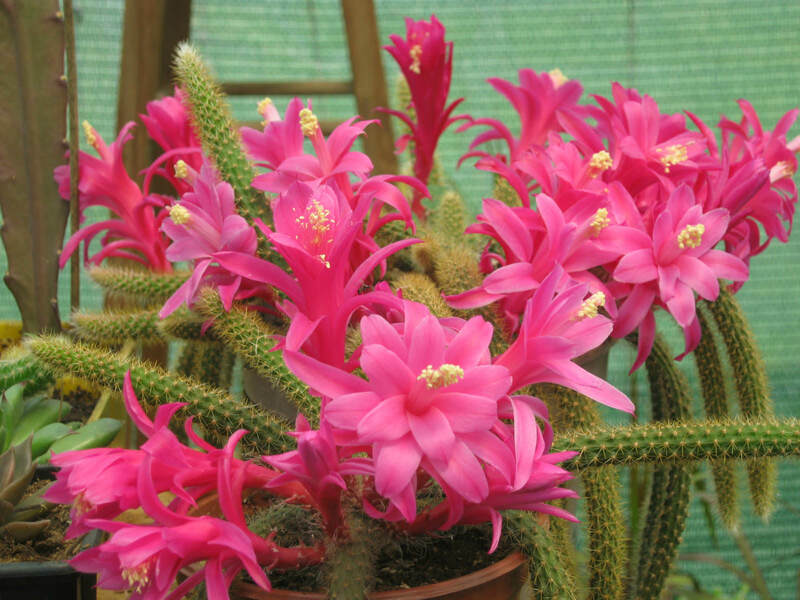 Rat Tail Cactus is easy to cultivate and relatively fast growing cactus. Their trailing stems make these cacti ideal plants for a hanging basket. Line the basket with sphagnum moss before filling it with potting mixture and make sure it is hung where the prickly stems will not pose a treat to the unwary. If Rat Tail Cactus is grown in a pot, hang the pot up or attache it to a high shelf. If it is left free-standing, it can soon be overbalanced by the lengthening stems. To propagate, use either 6 inches (15 cm) tip or 6 inches (15 cm) segment of any part of the stem. Allow each cutting or segment to dry for three days. Then insert it about 0.8 inch (2 cm) deep in a small pan or pot of the recommended potting mixture for mature plants. Be sure that any stem segment is planted with the bottom end down. If this shallowly inserted cutting tends to fall over, it can be supported by being gently tied to a small wooden stick. Cultivation needs of cuttings are the same as those for mature Rat Tail Cactus and rooting will occur within a few weeks. Rat Tail Cactus can also be grown from seed. Being easily subject to attack of parasites (like red spider mite) and scale insects. Generally disease free.